Nuku Hiva is an island in the Marquesas, the northeasternmost group in French Polynesia and one of a couple places where most boats make landfall after crossing from the west coast of North America. On March 16 we set out for Nuku Hiva from La Paz. After leaving around noon we stopped a few hours later at Puerto Ballandra, one of our favorite anchorages in the area. We needed to decompress from all the work preparing the boat, and especially the last minute engine problems. We had a nice, relaxing afternoon and got a full night’s sleep, our last for a while. The next morning we left at 6am for the 150 mile trip to Cabo, running both engines the whole way to test them as much as we could. We got to use the sails a little and deal with headwinds a little, but most of the trip was calm. In the afternoon, when we were about a third of the way there, we encountered a humpback whale that kept slapping its tail over and over, quite a display. After motoring through the night we arrived in Cabo the next morning around 9am. After anchoring, Lisa hailed a water taxi, who took us in to fill jerry cans with fuel and to drop us off on the beach to go shopping. We spent an hour at Costco to do our final provisioning, returned to the boat on another water taxi, spent a couple hours relaxing and putting things away, and then finally left in the early afternoon. As soon as we got past the point sheltering Cabo the wind came up. 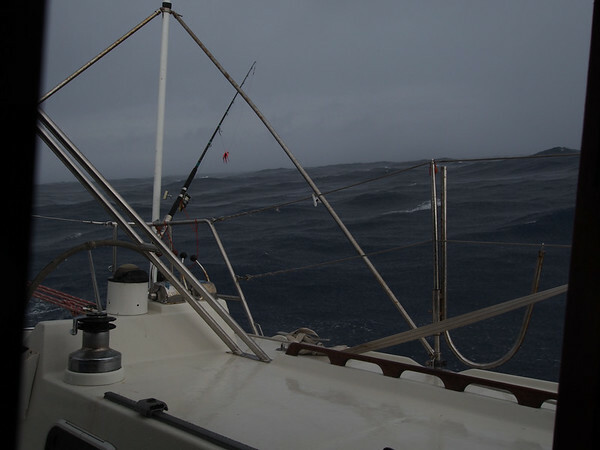 The route to the Marquesas is southwest, but these winds were west and we had to head south to make much progress. After a few hours the winds started bending back behind us and by the next morning we were on a direct course for Nuku Hiva. 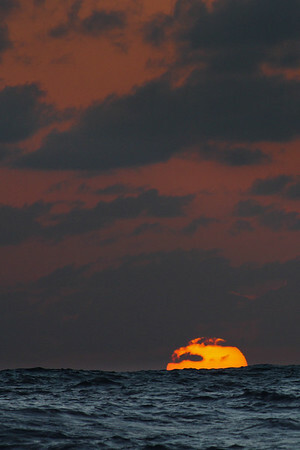 We would sail continuously for the next ten days, covering about 1400 miles and more than half the distance. Before researching this trip I thought of this crossing as being pretty uniform, just a big empty ocean that you sail across with the wind behind you. This was, broadly, our experience, but there were some finer details that needed planning. All the sailing we did early on was in the northern tradewind belt, the band of consistent northeast winds that starts around the Tropic of Cancer and stretches down towards the equator. As you approach the equator you encounter the Intertropical Convergence Zone, or ITCZ, the mixture of calm and unsettled, squally weather that divides the northern and southern trades. The location of the ITCZ varies, but we hit it around 6 degrees north. After passing through it we were in the southern trades, which are supposed to have consistent southeast winds but were kind of weak as we passed through. The rest of the way to Nuku Hiva we had a mixture of great sailing, calm weather, and squalls. Up to this point, the longest passage we had done was three days; we expected this one to take at least three weeks, and going on such a long trip takes some adjusting. We started on a watch schedule where I would be on watch in the evening until midnight, Lisa would take over until 4am, then I would take over until she woke up. This worked pretty well but we still felt sleep deprived, would nap during the day and never felt fully awake and alert. I had kind of expected to be able to sleep pretty well on passage out on the ocean, but this didn’t quite happen; while there were almost no other boats around to watch for, the winds needed frequent monitoring and later in the trip we had to watch for squalls at night. We settled into a pattern where I would handle the sails and Lisa would take care of cooking and cleanup. Much of the day we were both able to relax and recharge; the stress of the sailing made it hard to concentrate on other things for much of the passage, but later on as we got used to things I started doing some work and Lisa painted a series of beautiful watercolors. Working with the sails was a lot of fun. 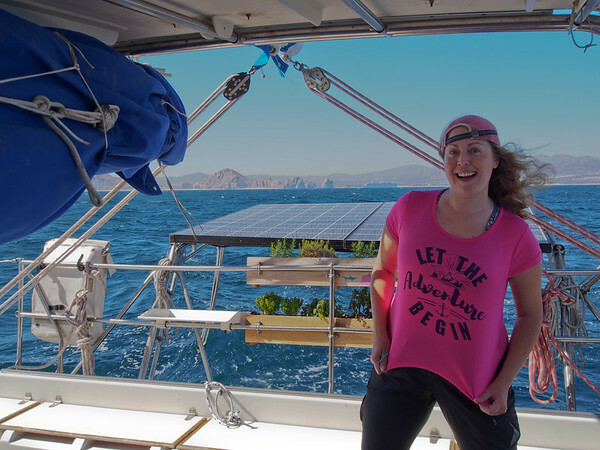 While Magic is putatively a sailboat, in Mexico we only got to sail intermittently; the Sea of Cortez isn’t all that windy when northers aren’t rolling through, and we didn’t spend much time sailing in the northers (except for our trip south around Thanksgiving of 2015, which had lots of great wind). On this passage I was working with the sails every day, and they were always up. In the end we sailed over 70% of the distance to Nuku Hiva, motor sailing the rest of the way. The wind direction changed slowly, turning about 180 degrees over the course of two weeks. We were on a starboard tack the first few days, then the wind came from directly behind and we used a tradewind rig (twin headsails with no mainsail) for several days. 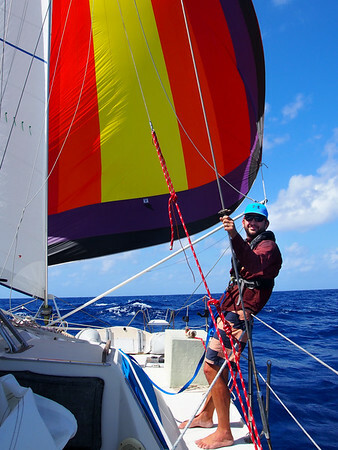 As we got closer to the equator the wind continued to shift onto a port tack and stayed there the rest of the trip. Most of the sail work was necessary to manage the amount of power we had; while the wind didn’t shift it did vary quite a bit in strength, and multiple times per day I would need to reef the sails (reducing their area and power), shake out a reef (getting that area and power back), or deploy or douse the spinnaker (a giant free flying sail used in lighter winds). Most days I would also patrol the boat looking for chafe points; lines under tension that are rubbing against other things will be damaged pretty quickly. We didn’t have problems with chafe, except for a core shot reefing line early on in the trip, but we did have some other sail related carnage. All of this revolved around the whisker poles — aluminum poles, 15′ long on our boat, that are used to hold sails out and away from the boat, and that make managing a tradewind rig or the spinnaker a lot easier. When we got Magic I didn’t know how to use the poles, and it took years of failed attempts before I finally did some research and experimented to develop a reasonable technique. That technique showed its flaws early on in the passage. Early in the trip, one afternoon a line on one of the poles broke, and I had to drop the sail it was supporting and bring the pole back to the cockpit to repair it. That same night another line attached to the same pole broke, and I had to go forward and rig a new, beefier line to get the pole back in position. This worked for several days, but then the pole itself snapped in half. This was during one of the first squalls we encountered and some of the strongest winds of the trip, and I had to go forward — in the middle of the night, in a rainstorm — to wrestle down the free flying jib the pole was supporting, which had gotten around the forestay and was flapping around violently, and to get it back into the cockpit with Lisa’s help. This went pretty well, though, and the rain was warm and refreshing. Before starting the trip, I was pretty concerned when reading about all the squalls in the part of the world we would be sailing to. We’d never seen squalls in Mexico, except for a monstrous one in the fall of 2014 that generated winds over 40 knots and the most intense seas I’ve ever seen (being anchored right off a lee shore didn’t help matters, either). So I may have been expecting to see more squalls like that one on the passage, but nothing we encountered even came close. 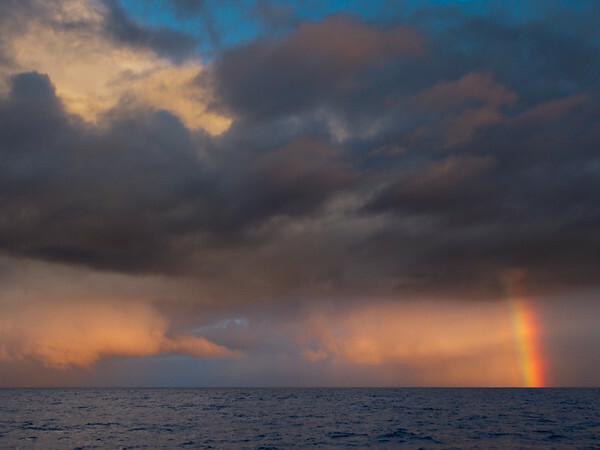 As we neared the ITCZ we started seeing squalls, and would continue to see them every day for the rest of the trip, most often at night but sometimes throughout the day as well. We could easily see them on the radar; most would pass by miles away but we needed to watch for ones that would pass over us and require us to reduce sail and close hatches. All the squalls had rain, and most of them had increased winds in front of them and reduced winds behind them. The latter was the most annoying thing about the squalls; after one passed over us we could bob around without much wind for more than an hour. 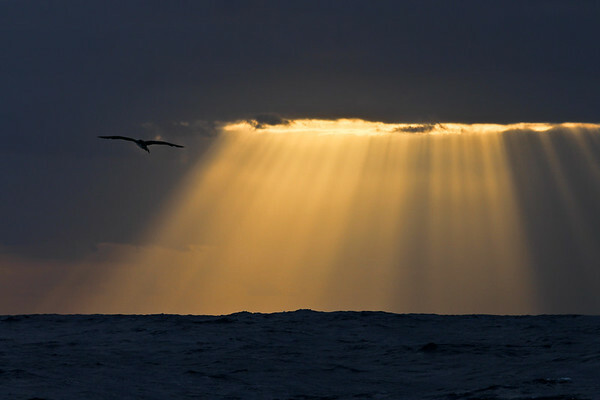 (Squalls form when warm, moist air rises, the moisture condenses, and the air sinks back down, bringing air flow that radiates outwards from the base and adds to or subtracts from the underlying wind.) Before the trip I’d been paranoid about lightning from the squalls, but we only ever saw a couple of flashes. As we entered the ITCZ we finally started motoring. The forecast was pretty inconsistent about its size and position and we wanted to move through it as quickly as possible. After less than a day we were past it but winds were light so we continued motoring. The following afternoon, after I started up the engine I noticed the tachometer and alternator weren’t working so I looked in the engine room to find a lot of foul smelling smoke. The temperature alarm on the engine went off and I shut it down and used the other engine instead. It’s pretty disconcerting to have engine problems in the middle of the ocean, and I’m always glad to have two engines. Thinking about the symptoms I was pretty sure it was a problem with the V belt, and sure enough when I looked at the engine the next morning the belt had torn (creating the smoke) after a bolt connecting the alternator to the engine sheared. Dealing with this bolt was a gigantic headache; the rest of the bolt was still in a little tang and I could not get it to budge with penetrating oil, heat, or easy-outs. After breaking off an easy-out in the bolt I managed to drill a hole all the way through the bolt, and then broke the drill bit off too. I used a dremel to cut off the back of the tang and expose the hole the bolt was in; this let me clear the drill bit and start drilling the hole out using larger bits. After breaking several bits I finally got the hole out to 1/4″ (from its original 3/8″) and called it good, installing a new and smaller bolt and getting the engine running again. This procedure took up most of my time over seven hours, spending ten or fifteen minutes at a time in the engine room and then coming out, dripping with sweat, to cool off, hydrate, and plan the next steps. Fortunately, this was the only problem we had with the engines on the entire crossing. Despite all the headaches it caused, I’m glad we did all the maintenance work on the engines before leaving, as problems with the injectors or especially the saildrives might not have been repairable at sea. After leaving the ITCZ we alternated motoring with sailing for the next several days as we continued southwest. Winds were frequently light and the squalls continued so we didn’t want to carry a lot of sail, but several times there was a nice wind all day and great sailing. 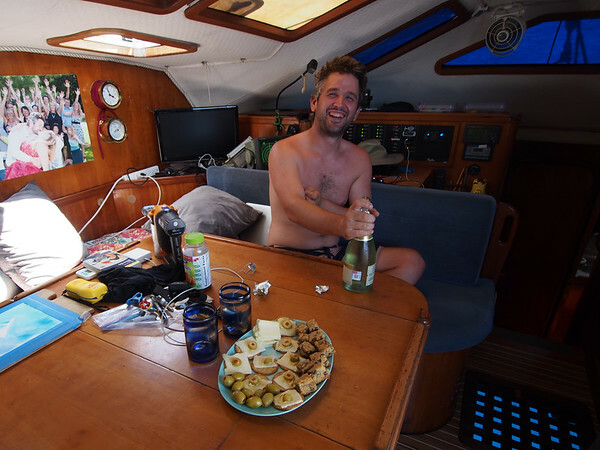 We motored across the equator, having a nice little party with champagne and hors d’oeurves, and then passed through a second convergence zone with yet more squally weather. I’m used to a fairly fast pace of life, and being isolated on the boat for three weeks with limited tasks to do was definitely different. It was great spending so much time with Lisa, we got along really well and even just hanging out with her was lots of fun. We only saw one boat the entire time mid ocean; all other boats we saw in person or on the radar were within a couple hundred miles of Cabo. 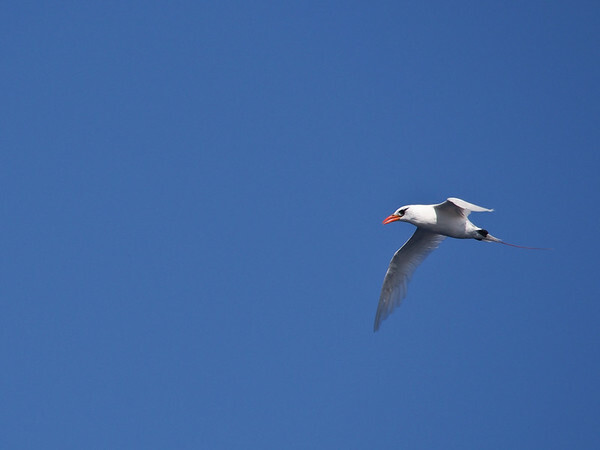 There were birds around pretty regularly near shore as well, and while birds did visit the boat mid ocean we would only see one or a few at a time, ducking through the waves or flying past. 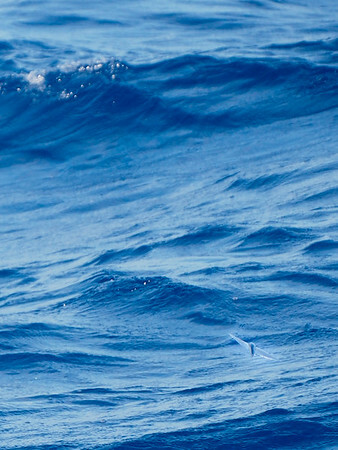 The first half of the trip had many flying fish, which would frequently scatter at the boat’s approach and skim near the surface of the water for a hundred feet or more; several times Lisa and I rescued fish that flew into the cockpit while we were on watch, and each morning I would patrol the decks to look for corpses to toss overboard. Early in the trip we caught a few bonito to eat but after getting far enough from shore that stopped. 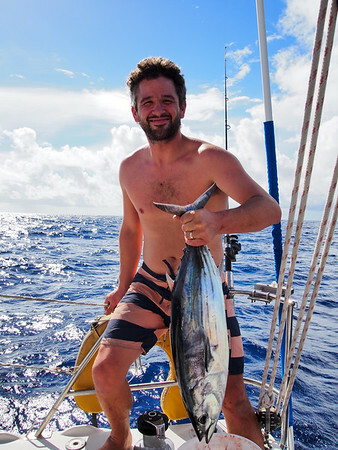 When we got within about five hundred miles of Nuku Hiva the fish started biting again. I caught a small, tasty bonito and lost quite a few lures with our lightweight tackle (I meant to get burlier stuff before we left La Paz but it didn’t happen). In one especially stupid incident I brought a beautiful tuna up to the boat, only for the leader to break when I tried to lift it out of the water by hand (instead of with a gaffing hook). I was a little inebriated at the time, and have vowed from now on to stop and think before doing something new or complicated in such a state. The trip wasn’t quite over, though, and the fish kept biting. The next evening I finally boated a nice tuna, about thirty pounds and enough fillets for six or seven meals for us. This was the evening before we were due to make landfall. After spending an hour dealing with the fish we relaxed on deck until sunset, enjoying the smooth sailing, beautiful clouds, and great temperatures. In the middle of the night strong winds came and more squalls set up around us (with some lightning this time), but we’d seen enough of these by now that we weren’t too worried. Dawn came, the wind died, and we motored the rest of the way as Nuku Hiva came into view. Steep green cliffsides, lush valleys, and a rich scent of the earth greeted us as we made our way to the south side of the island and into Baie de Taiohae, the site of the main anchorage and town on the island, and where we needed to go to check into the country. We had been at sea for 21 days, and the island was stunningly beautiful. As excited as I am to be in French Polynesia after a decade of dreaming, this crossing was a fun and interesting experience and a good opportunity for reflection. I’ll look forward to other long passages in the future. This entry was posted in Cruising 2017, Sailing. Bookmark the permalink.